Walt Disney World has announced that overnight guests staying at Walt Disney World resorts soon will pay nightly fees for parking their cars. The new policy goes into affect for guests who book reservations on or after March 21. Guests at Disney Value Resorts (Pop Century and the All-Stars) will be charged $13 per night. Guests at Disney Moderate Resorts (Carribean, Coronado Springs, Port Orleans) will be charged $19 per night. 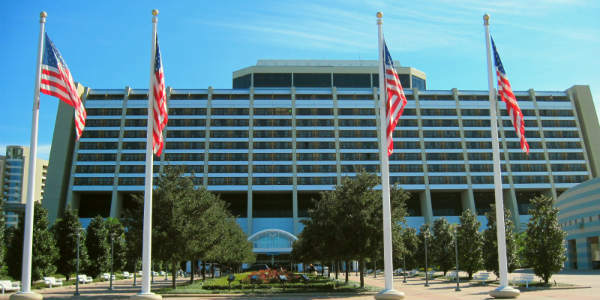 Guests at Disney Deluxe Resorts (Animal Kingdom Lodge, the Yacht and Beach resorts and the monorail hotels) will be charged a whopping $24 per night. Visitors who are at the Disney World resorts for dining or shopping experiences will not be charged for their parked vehicles, according to a Walt Disney World spokesperson. I’m wondering if this means they will be validating parking receipts – it wasn’t made clear in the announcement. This overnight resort parking fee is new to Walt Disney World, but other hotels in the tourist district, such at hotels at Universal Orlando and many near the Orange County Convention Center charge around $20 per night parking. Certainly increased revenues are a goal of this new fee, which doesn’t sit well with long-time Disney fans I’ve talked to. But the move also serves to isolate guests on property. With the new parking fee, guests will think twice about renting a car to go to other Orlando parks/attractions. This means they’re more likely to stay on Disney property their entire vacation, spending their money with Disney. What do you think of Walt Disney World enacting these new parking fees for the first time? Let me know in comments.